Paracelsus was born Theophrastus Bombastus von Hohenheim in November 1493 in Einsiedeln, Switzerland, the son of an impoverished physician. In his youth, he was introduced to alchemy, a medieval art aimed at changing base metals to gold or silver, at a school for mining and metallurgy. From 1507 through 1512, he traveled across Europe and is thought to have attended seven universities and been disappointed with them all. Historians believe he received a degree in medicine from the University of Vienna in 1510. Around 1516, Paracelsus began to publicly attack the prevailing medical views of HIPPOCRATES, GALEN, and IBN SINA. He criticized the theory of the four bodily humors, originating with Hippocrates, and adopted the name Paracelsus, which means “surpassing Celsus,” referring to a first century Roman physician and implying his superiority over the ancients. For several years, Paracelsus worked as an army physician in the Netherlands and Italy. He sought out the most experienced alchemists across Europe and gained new practical knowledge, which he used to great success while treating diseases and wounds on the battlefield. His reputation for healing powers spread quickly during his service. On the heels of his newly acquired reputation as a miracle healer, he received an appointment to lecture at the University of Basel in 1527. Despite his popularity among students, he was forced to flee in 1528 after offending university authorities by burning the works of Galen and Ibn Sina. For the next eight years, he remained in exile and wrote medical treatises outlining his theories. He proposed, for instance, that disease was caused by foreign parasites that disrupted normal body chemistry and that mental health was dependent on physical conditions, not on evil spirits. His innovative medical treatments were rooted in an advanced understanding of chemistry and mineralogy, which allowed him to make great improvements over traditional alchemical treatments. In 1530, Paracelsus introduced a clinical description of syphilis and prescribed mercury as treatment. He correctly claimed that silicosis (a miners’ disease) was caused by inhalation of metal vapors. He was the first to state that small doses of the agent that causes an illness can be used as a treatment for that illness. He passionately advocated the use of minerals and chemical compounds to cure illnesses. 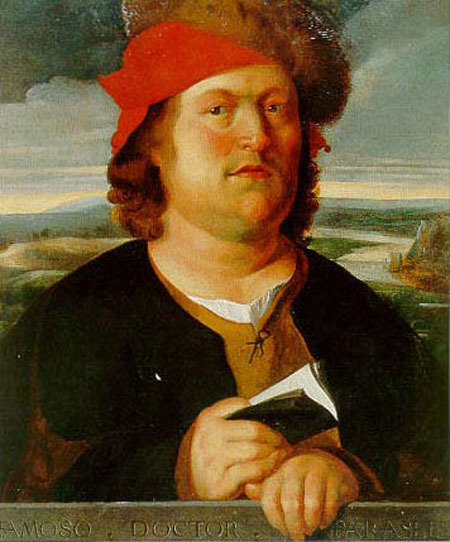 Paracelsus died under mysterious circumstances in Salzburg, Austria, on September 24, 1541. Paracelsus contributed to the evolution of medicine by challenging traditional dogma and by insisting on the importance of chemistry in human health. Paracelsus inspired his contemporaries to question the authority of Greek and Roman medicine. The teachings of Hippocrates and Galen, translated and preserved by Arab scholars during the Middle Ages, were followed blindly during the European Renaissance. Physicians stood by the theory that health requires a balanced state of bodily humors, and bloodletting was a common treatment for a variety of ills. Paracelsus opposed bloodletting and believed that a balance of chemicals—not humors—within the body maintains health. His prescription of minerals and chemicals shaped the development of his followers’ methodologies. Paracelsus’s disciples developed new medicines and discovered methods of preparation and purification. Paracelsus stressed the importance of separating out the active ingredients of medicines and consequently purified a great many substances. His followers honed his experimental methods, which aided the development of pharmaceutical and experimental chemistry, both of which blossomed during the seventeenth century. Among the best known followers of Paracelsus are: Oswald Croll, who isolated succinic acid from amber; Leonhard Thurneysser, a famous alchemist; and J. Duchesne and Theodore Tourquet de Mayerne, who discovered benzoic acid.